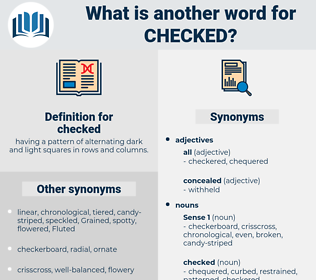 What is another word for checked? having a pattern of alternating dark and light squares in rows and columns. 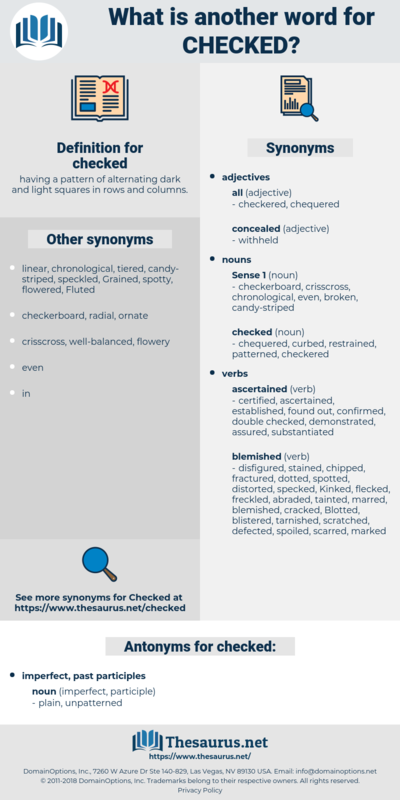 Scrutinized, Searched, Chose, registration, discovered, supervised, locked, cross-referenced, validated, Caught, confirmed, Assessed, Picked, determined, ransacked, observed, Compared, telephoned, Indicated, Surveyed, analysed, Forwarded, accessed, reconciled, traced, Scanned, stopped, ensured, disclosed, insured, recorded, noticed, reported, Screened, IOOKED, handled, curbed, 'vecalled, Listened, decided, Came, processed, authorized, registered, licensed, saved, phoned, Managed, contained, GOTTA, Communicated, dominated, addressed, Were, AM, completed, circulated, Achieved, Performed, witnessed, assured, authorised, endeavoured, sought, Wrote, ordered, Followed, noted, CAILED, Worked, revealed, commissioned, conducted, experienced, Forgot, Discussed, Responded, permitted, drove, proved, Cited, Told, Frisked, Captured, scoped, Arrived, broke, sat, taped, Transpired, transmitted, Replied, Answered, realized, conferred, baked, Summoned, cleared, peeked, left, Approached, Walked, know, Knew, matched, Enjoyed, learned, Occurred, travelled, Happened, Took, pursued, pointed, spoke, Logged, Strived, Strove, dug, Incurred, Toured, requested, Had, emerging, Flew, heard, Provided, Prevailed, filled, expected, Aimed, nothing, Rang, Swore, assumed, owned, Appealed, seized, lost, Accounted, Anything, spotted, Grabbed, focused, Gave, posted, release, showed, Overran, found, Believed, turned, Entered, Allowed, Termed, admitted, Met, attempted, called, Stayed, Dealt, Popped, drew, Went, let, tried, radioed, 'm, wanted, thought, news, pulled, Did, dropped, down, Ran, drinking, drinks, 'd, Got, named, consult, Consulted, Consulting, audits, Audited, saw, see, seeing, monitoring, visit, Visited. Scrutinized, characterized, investigation, evaluated, characterised, cheched, choose, scrutinised, Challenged, Searched, guaranteed, detected, discovered, restricted, substantiated, watch, supervised, locked, Ceased, researched, Probed, Intercepted, validated, re-examined, reconsidered, confirmed, Existed, Assessed, Picked, acknowledged, determined, calculated, balanced, corroborated, available, measured, extinguished, regulated, analyzed, Administered, Clicked, interrogated, discouraged, Retrieved, Discriminated, demonstrated, certified, tracked, Overseen, observed, protected, kicked, pre-tested, blocked, controiled, Compared, enforced, safeguarded, consultation, Experimented, Tackled, reassessed, Indicated, Surveyed, Manipulated, analysed, Appraised, Forwarded, Compiled, accessed, reconciled, Ticked, discontinued, stopped, established, documented, presented, Exercised, revisited, restrained, packed, ensured, actuated, accomplished, revised, Prevented, Perpetrated, interviewed, insured, Hindered, recorded, illustrated, noticed, Curtailed, reported, terminated, serviced, impeded, obstructed, evidenced, Screened, suppressed, enforceable, handled, curbed, estimated, constrained, perceived, Collated, highlighted, processed, labeled, labelled, registered, licensed, saved, secured, preserved, advised, Policed, arranged, Confronted, Managed, contained, braked, Been, pronounced, recognized, Hampered, handicapped, Filed, Influenced, dominated, designated, Punctuated, addressed, AM, connected, completed, defined, sampled, hung, exposed, Achieved, valued, Prosecuted, inquiry, Performed, witnessed, assured, Canvassed, sheltered, Encountered, Energized, endeavoured, conditioned, Earmarked, sought, Scored, executed, educated, guarded, Undertaken, Followed, finalized, knowledge, subdued, noted, supported, attested, seen, directed, scheduled, edited, Reined, Worked, conquered, informed, assembled, revealed, kept, mediated, depressed, Submitted, conducted, discarded, Invoked, ruled, experienced, Discussed, ended, fixed, driven, expressed, Questioned, affected, thwarted, departure, Detained, harnessed, proved, outlined, governed, disrupted, guided, Operated, concluded, satisfied, reflected, broken, Ascended, Obtained, Patrolled, prepared, Captured, Queried, maintained, Undergone, arrested, sat, reversed, cf., stifled, taped, Deployed, realised, Upheld, Compromised, halted, realized, embodied, vetted, known, desired, cleared, Learnt, covered, practised, taken, faced, Demanded, Approached, practiced, seared, stemmed, used, Enjoyed, learned, Occurred, sent, Happened, pursued, pointed, Arisen, Logged, ridden, Strived, mandated, Subjected, mastered, Incurred, shielded, Emerged, Flown, Anchored, Installed, amended, reformed, Polled, affirmed, requested, engaged, stored, heard, shaped, Provided, Debated, Rated, filled, Assayed, Aimed, stamped, set, Tossed, powered, worn, fulfilled, printed, owned, held, tagged, cast, Climbed, paid, focussed, Blazed, invested, Accounted, treated, signalled, focused, given, Regarded, Lodged, Shown, Judged, effected, Tripped, trusted, posted, Carried, paved, fired, defeated, Stalled, dumped, found, Piloted, turned, thrown, tainted, risen, jammed, Entered, booked, scarred, Brought, Met, Slowed, attempted, called, Stood, Dealt, applied, drawn, Borne, gone, seated, Boarded, laid, put, marred, failed, stated, tried, Fitted, Claimed, wanted, made, done, armed, run, dropped, mounted, Acted, shed, Consulted, Audited, monitoring, activated, Visited. The slight exclamation and a meaning frown from Wolfenden checked his speech. But though her coming checked any further hot words, it could not drive away the recollection of what Mary had said.